Prince Harry at The Wilderness Foundation with the Lord-Lieutenant Mrs Jennifer Tolhurst, back left, and Mr Phillip Tolhurst, back right. 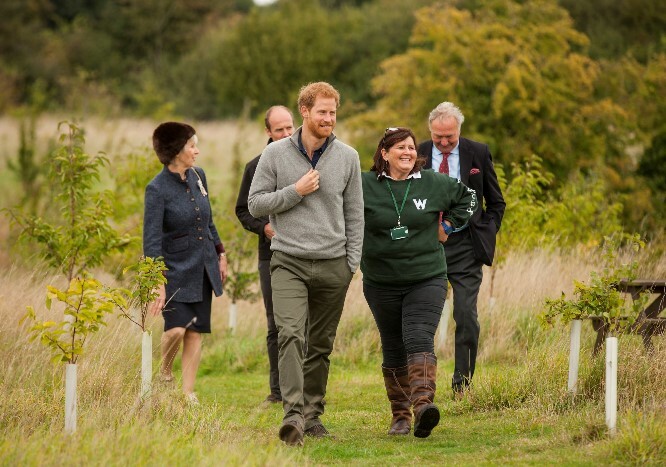 His Royal Highness Prince Harry visited The Wilderness Foundation’s Chatham Green Project in September. The Prince and his future wife Meghan Markle chose The Wilderness Foundation UK as one of seven charities to receive donations in place of wedding gifts in May 2018. The Chatham Green Project is a farm education and conservation initiative on 400 acres of farmland in Essex. The project investigates how to utilise land more effectively to better balance the 21st century needs of farming, nature and communities and provides National Curriculum linked educational activities for over 3,000 school aged pupils each year. During his visit Prince Harry met with pupils engaged in a range of outdoor learning activities, all underpinned by the principles of Leave No Trace. The Wilderness Foundation works to connect people with the natural world. They educate a wide audience, particularly young people, about the value of wild native and natural landscapes, creating stewardships into the future. They work extensively in native based settings, working on the personal, social and environmental outcomes that come from experience of the outdoors with a focus on healthy biodiversity and people. Prince Edward with Essex school children at Prested Hall, Feering. 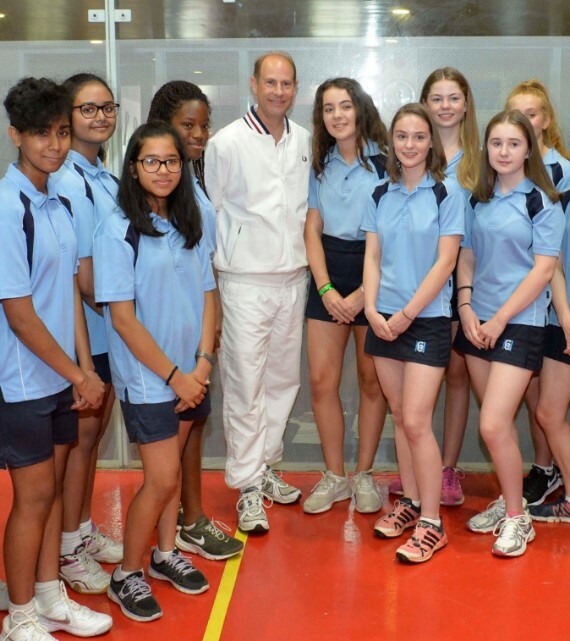 The Earl of Wessex, Prince Edward, played the ancient game of Real Tennis at Prested Hall in Feering with youngsters from nearby schools to help generate support for the Duke of Edinburgh’s Award when he visited Essex in July. Prested Hall is one of just 47 venues in the world to have real tennis courts. There are 27 in the UK and two at Prested Hall. Real tennis dates back to the 1500s and is played on an indoor court. The Prince plans to play on all 47 courts to raise awareness and funds for the Duke of Edinburgh Award. Pictured (left to right) are Adam Briggs (director of RSSi), His Royal Highness The Duke of Kent, Trevor Hall, Meredydd Hughes (director of RSSi) and the Lord-Lieutenant of Essex Mrs Jennifer Tolhurst. Road Safety Support International (RSSi) has received a prestigious business award in recognition of its success in exporting British enforcement and road safety expertise. In the UK, Road Safety Support helps the majority of police forces, highway authorities and safer roads partnerships in England, Wales and Northern Ireland. Since formation in 2008, RSSi has worked in North America, South America, Asia, Europe and the Middle East. In recognition of this success, RSSi has receive the Queen’s Award for Enterprise in the International Trade category, which was presented by His Royal Highness The Duke of Kent at a ceremony at the company’s office in January. The Queen’s Awards are awarded each year to businesses for outstanding achievement in four categories – International Trade, Innovation, Sustainable Development and for Promoting Opportunity. The Countess of Wessex meeting cast at Razed Roof at Harlow. 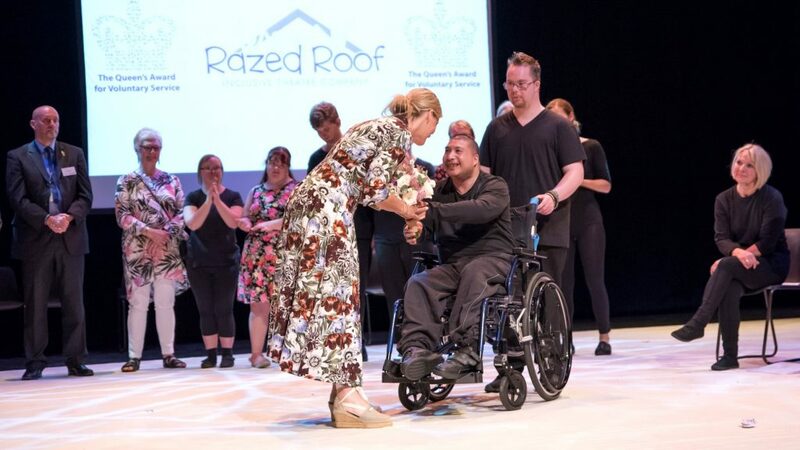 The Countess of Wessex watched a production by charity group Razed Roof at Harlow Playhouse and then meet the cast of the Queen’s Award for Voluntary Service winning group. The group help change the lives of disabled people in the area by giving weekly performing arts sessions for 16 adults with severe learning difficulties and disabilities. The countess then visited Remus Memorial Horse Sanctuary, Ingatestone. 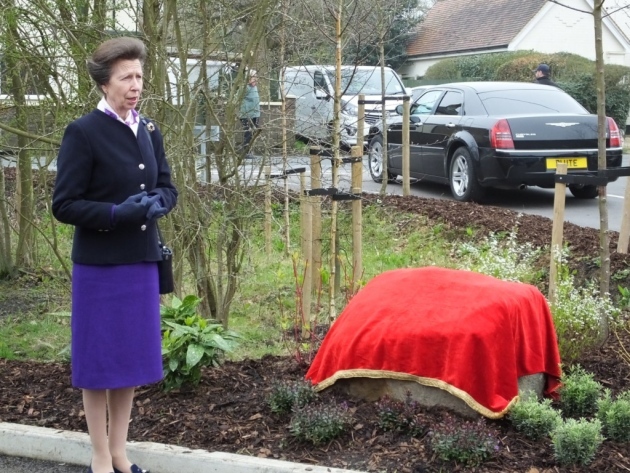 Her Royal Highness the Princess Royal, opened an affordable housing project at Mackmurdo Place in Wickham Bishops in April. Princess Anne toured the new affordable home and unveiled a plaque. The development of 27 homes was built by English Rural Housing Association. 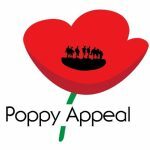 There were three other Royal visits one from HRH The Duchess of Cambridge, a second visit from HRH Prince Harry on a fact finding visit regarding mental health issues with soldiers and their families, and a private visit by Princess Michael of Kent.